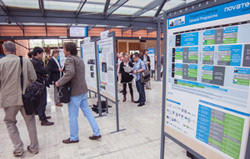 An overview of the friendly moments of the Novatech 2013 conference! IWA - International Water Association - is a network of 10,000 water professionals spanning the continuum between research and practice covering all facets of the water cycle. The IWA launched the "Cities of the Future" programme in 2009. Atelier Dreiseitl has more than 30 years of experience in pilot projects worldwide which work with water and urban landscapes. Dieter Grau, a landscape architect, has led projects of different size and scope, seeing urban water as a way to achieve social and ecological regeneration in cities.